It’s been a while to visit Harajuku. 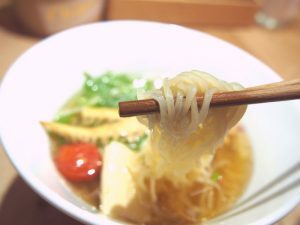 And I wondered if there is a place where I can enjoy vegan noodle and found the place after checking online! That’s Chipoon, to which I introduce you this time! NO MSG is used, and its noodles also don’t include any eggs so here is the place where you can enjoy vegan noodles! 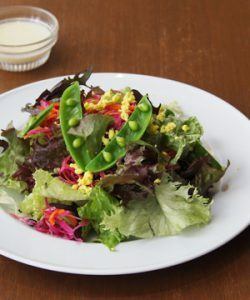 This shop has been produced by Hidetoshi Nishioka, who is the chef of “Renge Equriosity”. 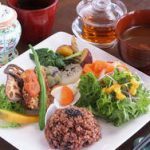 Renge Equriosity is well-established Chinese restaurant in Ginza. It’s about 5 minutes from Harajuku station to Chipoon which is inside Laforet HARAJUKU. I introduce how the shop was in this article. It’s located in Laforet HARAJUKU, which is a five minutes’ walk from Harajuku station. If you visit from Meiji-jingu Mae Station (Subway), it’s just a minute to the shop. 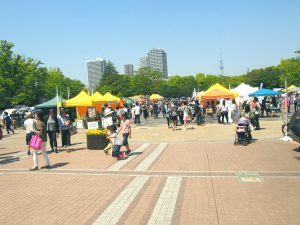 If you visit from Harajuku station, you just go straight after exiting the station through Omotesando exit toward Meiji-jingu Mae Station. Turn left at the intersection in front of Meiji-jingu Mae Station and you’ll see Laforet HARAJUKU on the left side. 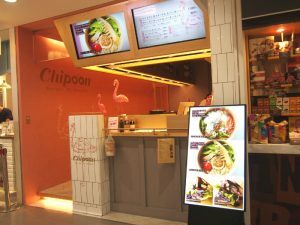 Chipoon stands on the 2nd floor of Laforet HARAJUKU. 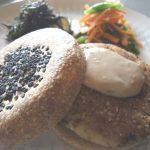 Ordering Vegan Noodle & Yuba Burger Set! Many times passed through the street in front of Laforet HARAJUKU but this is the first time to go inside! Took the escalator to the 2nd floor and went straight. Found Chipoon on the left! It’s a small, cute shop! 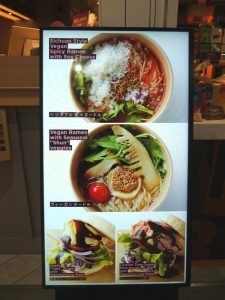 I could see Vegetable Tantan Noodle and Vegan Noodle on the signboard. Found Set Menu of burger. First I thought just veggie noodle is enough but I noticed the price of set menu was 900 yen (About $8). So I decided to order Vegan Noodle & Burger Set! Yuba is skin of Tofu so it is made of soybeans. Chashu is a grilled pork and usually sliced. 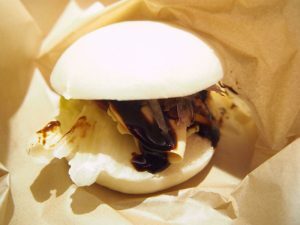 Yuba for burger is all the more rare, so I decided to order Yuba Chashu Burger (This one was veggie Chashu)! These are the all the menu for food here. If you order only Vegan Noodle, it is about $5, for Chashu Burger, about $4. I think the price is less than 2/3 compared to those of other standard veggie noodle shops in Japan. But please note that only ordinary Chashu burger is not veggie one but real pork one. 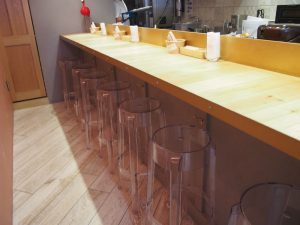 There are 8 counter seats. It’s a quick style rather than to relax, yes Ramen shop is like that. It was about 6 pm when I visited the shop and the customer was only me. It’s weekday so most people are still working. And next to me is Flamingo? 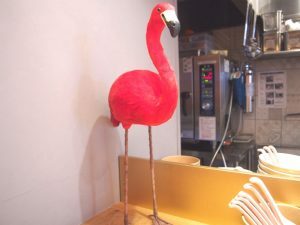 Come to think of it, there were drawings of Flamingo on the wall inside. I see, maybe symbol of this shop. I waited the food at the counter and other customers from overseas visited. 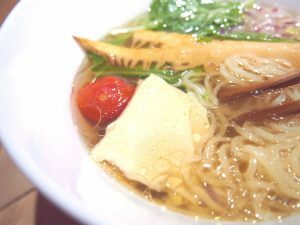 Like the case of T’s Tantan in Tokyo Station, Veggie Noodles are very popular among people from overseas. As it’s in front of the kitchen, I could see the process of making of the veggie noodles while waiting. In five minutes, came Vegan Noodle!! The soup looks clear and good! Tomato also on the top. And then Vegan Yuba Burger also came after that! 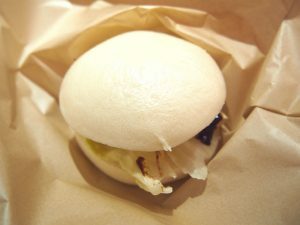 Looks like simple Chinese buns. 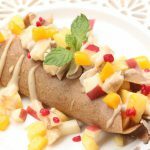 Vegan Noodle & Vegan Yuba Burger Set! First I try Vegan Noodle! 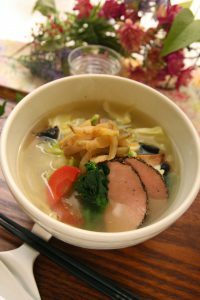 The moment I tried its soup, I found it’s very tasty! Until today, T’s Tantan was the best for veggie noodle to me but this veggie noodle also ranked in! How I can explain it, but I could enjoy fresh taste of citrus fruits and it was good! Actually ginger and lemon were used for the soup. If you like fresh Ramen, not like heavy one, I’m sure you like it! It reminds me a bit of the Asian taste that I enjoyed in Thailand and Vietnam long time ago. 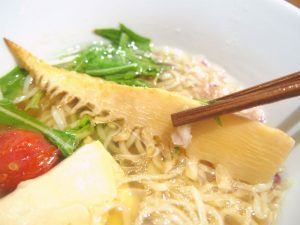 Instead of Menma (seasoned and processed bamboo shoots), I could see ordinary bamboo shoot. It’s been a while to eat Yuba but it was tasty! Next is Vegan Yuba Burger! Oh, is this Teriyaki sauce? I can imagine strong thick taste from the looks. 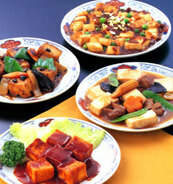 Vegetables such as Yuba, lettuce, onion, etc. inside. 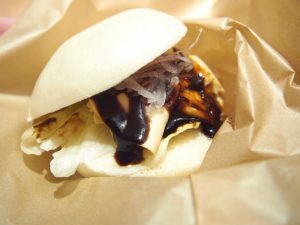 It looked like Teriyaki sauce but the taste was different, more light taste but you can enjoy rich taste of it! What is this sauce made of? I taste mixed flavors in it. I found that it was an original sauce made of veggie mayo, sesame oil and sweet flour paste (Chinese seasoning) after checking online. Buns were fluffy and soft. Chashu was made of soybeans. I could eat up quickly despite the substantial looks. 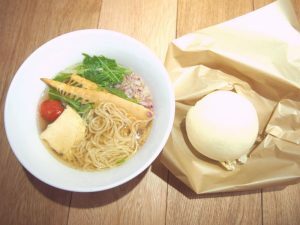 First I thought Ramen and burger might be heavy meal but I could eat up so if you are hungry, I recommend you Ramen & Burger Set! Manner of the waitress was also polite and nice. I was satisfied with both meal and service! 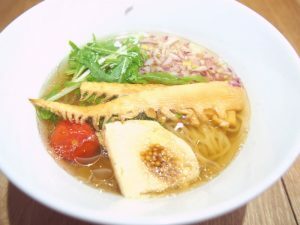 I did not know that there was a place where I can enjoy Veggie Ramen in Harajuku. Looks like it opened on December 2018. Oh, so it’s just 4 months ago! It’s nice that the location is close to the station! 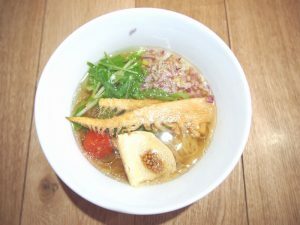 If you come visit Harajuku to hang out and feel hungry, I recommend you this Chipoon! Even non-vegetarian or vegan people can enjoy the Ramen I think! 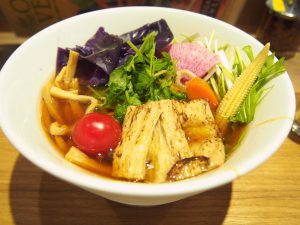 If you like Veggie noodles, Ramen of T’s Tantan in Tokyo station and Ueno station are also highly recommended! If you want to enjoy atmosphere of an ordinary Japanese house, here is the place. The cafe is actually a house, it is just like the house local people live in.